Posted by on Tuesday, April 26th, 2016 at 9:44am. 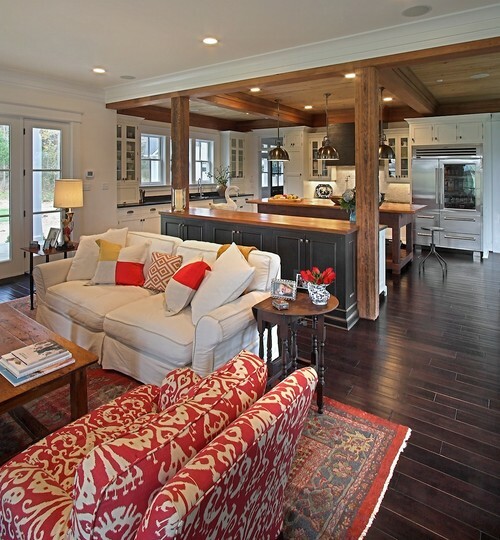 Houzz contributor Judith Taylor is an award-winning designer based in Toronto. Her tip is kind of like a designer's spin on clutter-reducing spring cleaning. When you want to give your living room a new look, consider paring down the amount of furniture you have in the room. "Gracious living means space to maneuver," Judith says. "You don't need to fill up a space with lots of furniture." This advice can go one of two ways for you. Either you've got a room you want to empty out and redecorate, or you've got an existing room you want to redesign with spot upgrades and changes. If you're going to furnish and empty room, Judith says, using this strategy means you can focus your money on a few high-quality pieces rather than spreading your funds across more mid-quality pieces. "Spend more of your budget on fewer but better-quality pieces," Judith says, "and your room will look better than if it’s stuffed to the gills with flea market finds." Have you ever stared at a painting that didn't have a focal point? It's a little disconcerting isn't it? Just like a painting, when a room doesn't have a focal point it creates confusion and a lack of cohesion. There are no set rules for what can serve as a focal point, so you've got some freedom to choose your star. However, consider selecting something that reflects the mood and purpose of a room. For instance, choosing a captivating painting is an excellent option for the living room. But for the kitchen? Not so much. Our expert Judith says a dramatic hood could work well in the kitchen. Bedrooms often benefit from a headboard that makes an elegant statement. "Whatever it is, choose something that will draw attention," Judith Taylor says. If you're on a tight budget or you want to add a small touch to one room so you can devote more resources to another room, consider adding new pillows to couches and love seats. House Beautiful contributor Victoria Pearson says choosing the right pillows one matching pair to bookend your couch. "Use two pairs, in contrasting patterns, colors and textures," Victoria says. Earlier we mentioned that painting is a more traditional way to transform the personality of your home. But rather than undertake such a time consuming task, think about painting your door instead. This Old House's Michelle Brunner recommends trying out a red hue for your door. Sound trendy? Actually, this color option has been around for a long time, she says. "A red door meant 'welcome' to weary travelers in early America, and on churches it represents a safe haven," she wrote. Other popular options for your front door are orange and yellow. If you're looking for the ultimate free design hack, you've found it. Many homeowners position their sofa and chairs according to where the TV is. However, by doing this you're missing out on a great opportunity to create a cozy feel in your living room. Michelle Brunner says thoughtful positioning of your chairs and sofa can create an environment that encourages conversation. "Think of a nice hotel lobby: The furniture is arranged in groupings that invite conversation," she said. "When you place the furniture in your living room, aim for a similar sense of balance and intimacy." Try using a U-configuration (sofa on the bottom, chairs on the side facing the coffee table) or an H-configuration (chair facing sofa with coffee table in between). Have you tried any of these techniques and tips? Let us know in the comments section below!